Located off of the lobby of The Chatwal Hotel, this luxe but comfortable room serves breakfast, brunch, lunch and dinner and seats 80 comfortably among spacious red leather banquets. 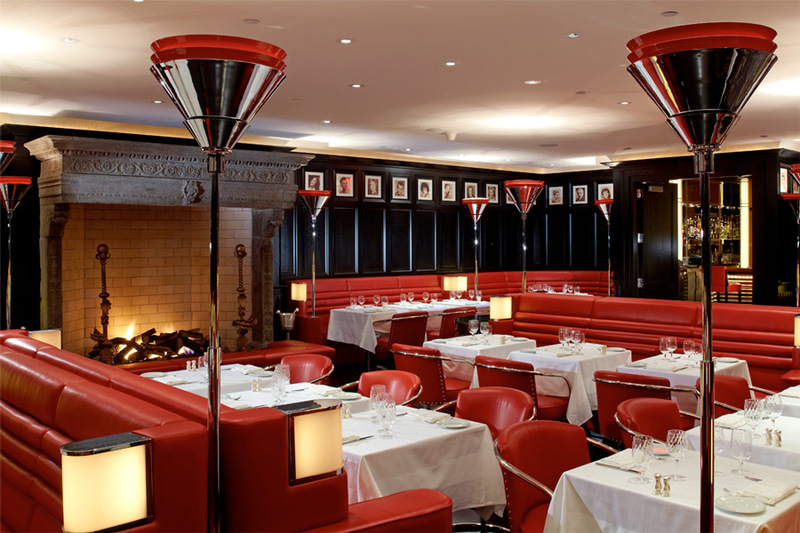 Featuring a fully restored 18th Century French limestone fireplace, black and white photos of Broadway and Hollywood royalty, chrome light fixtures and hand crafted leather banquets, The Lambs Club restaurant has an elegant clubhouse feeling. As The Lambs Club is one half block from Times Square, the restaurant features both Pre and Post theater menus and Live Music every Saturday & Sunday during brunch. Located one level above the restaurant, The Lambs Club Bar overlooks to the Lobby of The Chatwal Hotel as well as 44th Street through a wall of floor to ceiling French doors. With abundant natural light, the bar by day serves as a space for people to gather, have a meeting, pre matinee lunch or just to enjoy afternoon tea with friends. Complimentary Wi-Fi available. As nighttime approaches, the cocktails and award winning wine list take center stage. Hand cut ice, custom glassware and meticulously crafted beverages made with fresh pressed juices make this a Midtown haven for enjoying an expertly composed drink in style. The full a la carte dinner menu becomes available in addition to light fare and bar snacks. Reservations can be made for drinks or dinner and large groups can be accommodated. Tuesdays through Thursdays, The Lambs Club features a rotating selection of DJs and live bands from 5:30pm–9:30pm. In the lobby of The Chatwal Hotel, a bespoke bar recalling the age of steamship travel offers a few barstools to enjoy a champagne cocktail and watch the comings and goings of the hotel. The limited barstools have become a coveted seat for a meal at lunch, and dinner guests like to gather here before sitting in the Dining Room. Situated on West 44th Street, a half of a block from Times Square, The Lambs Club offers Pre and Post theater options for all types of theater-goers. For dining before heading to a show, a three course menu is served alongside fabulous wines by the glass and half bottles of wine. For relaxing post-show, both the Restaurant and the Bar offer a full dinner menu, a lite bite bar menu and distinct cocktails chilled with hand cut ice. Before your matinee on Wednesday the Bar offers a three-course lunch menu and live music adds to the atmosphere of brunch on Saturdays and Sundays.